While some have criticized Batman’s use of firearms in the recent Batman v Superman: Dawn of Justice as a betrayal of the character’s ideology, other fans have embraced Ben Affleck‘s more violent take on the Dark Knight. Now, with a new Justice League Batmobile image today posted to Vero, director Zack Snyder suggests that Justice League will very much continue to depict the latter side of Batman. 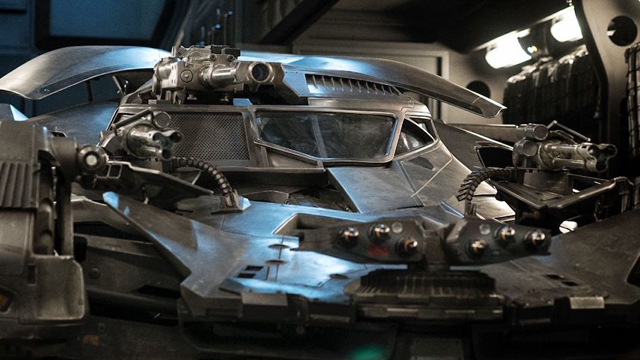 As you can see from the new image, the Justice League Batmobile appears to have greater firepower than we’ve ever seen on the big screen before. Justice League also stars Henry Cavill as Superman, Gal Gadot as Wonder Woman, Jason Momoa as Aquaman, Ezra Miller as The Flash, Ray Fisher as Cyborg, Willem Dafoe as Nuidis Vulko, Jesse Eisenberg as Lex Luthor, Jeremy Irons as Alfred Pennyworth, Diane Lane as Martha Kent, Connie Nielsen as Queen Hippolyta, with J.K. Simmons as Commissioner Gordon, and Amy Adams as Lois Lane. What do you think of the new Justice League Batmobile image? Let us know your thoughts in the comments below!